Guide dogs play an integral role in the lives of their handlers. These highly trained animals enable a visually impaired person to move around safely and independently by helping navigate them in their surroundings. Based on the partner’s direction, assistance pets safely lead around obstacles, through intersections, and to stairs, doors, and other landmarks. FYidoctors takes a closer look at how these advanced pups are trained for a career as a professional seeing eye dog. Assistance dog organizations across Canada work to train and home puppies to provide the visually impaired with more independence, confidence, mobility, safety, and companionship. There are four training centres in Canada, located in Alberta, BC, Ontario, and Quebec. Each rely on the generosity of donors to serve citizens in their regions. Breeds most commonly used as guide dogs are Labrador Retrievers, Golden Retrievers, and crosses between Labrador Retrievers and Golden Retrievers. Candidates come from in-house breeding programs or international organizations that share and distribute puppies and breeding materials. Throughout the first two years of a dog’s life, trainers determine which dogs have the correct temperament, drive, and obedience to pass the necessary tests to become a service animal. Some are released at various stages in the program if it is determined that they will not qualify as an assistance pet. Although there is nothing wrong with the dog physically, there may be something that hinders their ability to perform necessary duties. For example, they could appear uncomfortable on buses, elevators, or in crowded areas like a shopping mall. Although guide dogs are given to handlers at no cost, the price tag of training one animal is approximately $35,000 and can take roughly two years. Sandra Cramer, Puppy Training Supervisor at BC & Alberta Guide Dog Services, works in Calgary running the puppy program. Her role involves finding, interviewing, and training volunteers to raise the puppies. She also holds obedience classes and meets with the caregivers in various places in Calgary to evaluate their skill development progress. BC & Alberta Guide Dog Services Puppy Training Supervisor Sandra Cramer with volunteer puppy trainer Evan Cribb and Buzz the guide dog. Puppies are raised in the homes of volunteers rather than in kennels. These caregivers receive the dogs at about seven to eight weeks of age and prepare them for advanced training. Through a supervised program, they teach them basic obedience and socialization skills so that they are comfortable in public spaces. Once the dogs complete the puppy raising portion of their training program, they enter advanced training. This takes four to six months. During this portion of training, dogs work with a Guide Dog Mobility Instructor to hone very specific skills. For example, a common assumption is that service animals make decisions to cross streets. This is not the case. They learn to take their handler to the corner, but the handler must know when to cross by listening for alerts at the intersection. There are various checkpoints and tests the dogs must pass to graduate as a service animal. Once they have completed training they are matched with a client. “I see the value of the difference it makes in someone’s life,” said Cramer. Working as a team with a handler for sometimes up to 10 years, a guide dog aids in navigating from place to place. Because the animal doesn’t know specific destinations, the handler must know how far to go and when to turn. The guide dog makes decisions when obstacles are encountered blocking their path. The team relies on each other to travel safely. The individual handling the dog must also be trained in orientation and mobility to be led confidently. BC & Alberta Guide Dog Services are also dedicated to spreading awareness of proper etiquette when approaching an assistance animal. Remember, guide dogs give blind and visually-impaired people and their families independence and freedom. If the person needs your help, they will ask for it. Many guide dog users enjoy introducing their dogs when they have the time, but don’t take it personally if the guide dog user declines your request. They know their schedule and their dog best, and may simply not have the time to re-focus their dog after a social interaction. The dog's primary responsibility is to support its human partner. 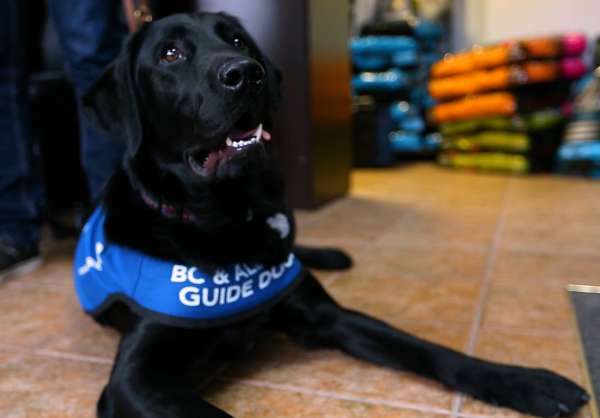 Some other basic tips can be found on our blog or the BC & Alberta Guide Dog Services website.